1. The tips are genuinely useful, not “let’s make this kinda useful, but use it as a Trojan Horse to sell stuff” that I’m unfortunately starting to see with greater frequency from brands that want to do Youtility marketing, but don’t have the guts or the permission to REALLY do it. 2. The tips epitomize marketing sideways; they don’t reference Lowe’s products specifically. My favorite is this example of how to make your own watering can out of a milk jug. Remember, Lowe’s SELLS watering cans. How amazing is it for a major corporation to create content that shows you how NOT to buy a product they retail? 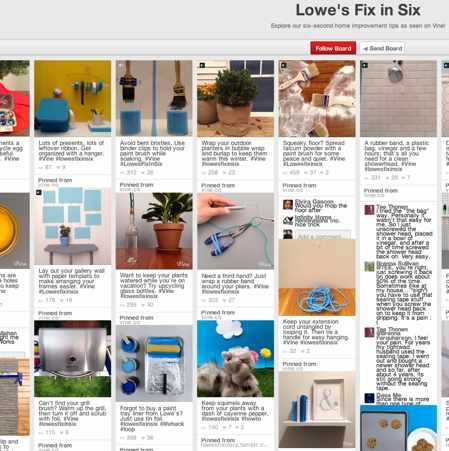 3.The content is partially crowdsourced, as many of the ideas for FixInSix executions came from Facebook fans, according to Brad Walters, the Lowe’s Director of Social Media and Emerging Platforms, who we interviewed on the Social Pros podcast here. Of all the places online that your content could conceivably live, your own website probably gets the least amount of traffic, not the most. Digital marketing success and Youtility success is becoming more about distribution than about production. More about push than about pull. And the best way to maximize your distribution is for your content to live in many, many places where your audience is already spending time. Thus, the digital dandelion strategy, whereby your website is the stalk where the content is planted, but versions of that content are spread far and wide, like the seeds of a dandelion. The FixInSix videos are the textbook example of the digital dandelion strategy, and “Atomizing Your Content” as an execution playbook. Atomizing your content is a term coined by Todd Defren of Shift Communications, and it is one of the principles I wrote about in Youtility. The premise is that you don’t need a content marketing strategy that requires you to come up with many great ideas, one after another. Instead, you need a content marketing strategy that has a few great ideas, and many, many iterations and executions of those ideas. You take your big idea and make lots of small ideas out of it, making them easier to spread with your dandelion strategy. The FixInSix idea lives on Vine but also on Tumblr, Facebook and Pinterest. FixInSix exists also as pre-roll video ads on Lowe’s paid digital marketing. It even lives on YouTube, where they wisely take original FixInSix videos, loop them 2-3 times and add opening and closing title cards: Presto! YouTube video. The brand also includes tips on its Instagram account, although without the FixInSix hashtag. But the one place FixInSix doesn’t exist may surprise you…..the Lowes.com website. That’s right, the best content idea Lowe’s has doesn’t even show up on their own site. True, Lowes.com gets 8 million + USA visits per month, according to Quantcast estimates. And that’s a lot of people. But it’s NOTHING compared to the potential audience on Vine, YouTube, Pinterest, Facebook, and Tumblr. They understand that reaching their potential customers in the places where they are already choosing to spend time is far more efficient than trying to convince those same people to come to their website to consume the content. Instead, they do their Youtility elsewhere, and use their website as the platform to monetize that attention. Of course you want to get your audience to your website, eventually. But it is far easier to do so when you build a content bridge from other popular locations leading to that site.